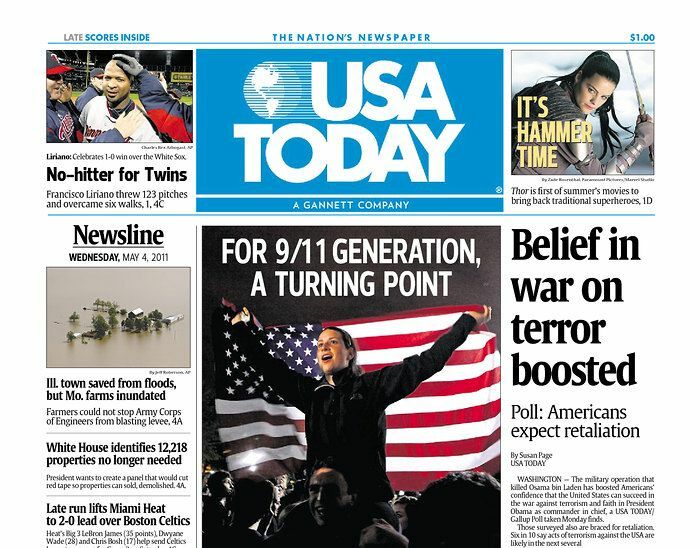 In Sunday’s Los Angeles Times, I’ve got an op ed on Osama bin Laden’s influence on the Millennial generation — and on the media’s lazy obsession with this angle. Neither poll data nor anecdotes support the idea that bin Laden haunted Millennials in any unique or lasting way, and their attention-mongering reactions — a favorite example: the Ohio State students who jumped into Mirror Lake, an act they normally save for the off chance that they beat Michigan — reveals more about their narcissism than their historical consciousness. In fact, in my op ed I end up arguing that the best way to understand Millennials is not in their relationship to bin Laden, but in their reaction to his death. I want to include some links to the media coverage and to highlight a couple more Yale-bin Laden connections. (Since I’m a graduate student there, I pegged the piece to Yale’s student reaction.) But first, I’ve got to say more about the whole idea of a Millennial generation (i.e., people born between 1980 and 2000). “Millennial generation,” which seems to be outlasting “Generation Y,” “the Facebook Generation,” and its other competitors, first appeared in Neil Howe and William Strauss’s 2000 book Millennials Rising. That date is important, because many of the generational traits Howe and Strauss would later attribute to 9/11 — Millennials are more public-minded, more self-aware, etc. — were first articulated in a book that came out more than a year before September 11. But that’s the value of generational thinking. It not only simplifies the gradual and messy progress of history (see this very good Chronicle of Higher Education piece for more on that), it can also be adapted on the fly. In fact, by September 12, 2001, Howe and Strauss were going on cable TV and explaining how 9/11 would shape Millennials. It’s like Voldemort is dead . . . . It’s a Harry Potter world. For this generation, there’s either pure evil or pure good. There’s no anti-hero. They’re out to get rid of these terrible forces and have a celebration. A happy ending. This is very defining for their generation. They’ve supplied the young troops who’ve been over there fighting for their lives. This strikes me as nonsense. It also strikes me as a perfect example of the soft-lit pseudo-science that lies behind Millennial thinking. Obviously, generations can serve as a useful heuristic. (How else would I have framed my op ed?) But when you put too much pressure on them as a predictive or historical concept — well, nothing good can come of it. Except maybe a few cable TV gigs. Of course, college newspapers covered the celebrations better than anyone else — including the Yale Daily News. See here and here and here and here. And yet, over the last year, the YDN, which on most days runs more content than your average metro daily, did only two articles mentioning bin Laden. He simply wasn’t a figure that occupied this or any campus. Nor, I think, did the military and its multiple engagements. The same week bin Laden died, and by coincidence, Yale’s faculty voted to begin the process of bringing the Reserve Officers Training Corps back to campus. In 1969, and as students demanded the organization’s elimination in protest of the Vietnam War, Yale’s faculty had effectively ended its ROTC. Now, 1969 isn’t 2011, and recent polls showed that most Yale students supported the return of the ROTC — but only after the military repealed “Don’t Ask, Don’t Tell.” For many of Yale’s Millennials, the ROTC didn’t come down to patriotism or national security or bin Laden’s at-largeness, but something else. That’s completely fine, of course, but it’s also instructive. It reveals the Millennials’ priorities. It also reveals how foolish they are to claim bin Laden’s death as a generational turning point.